Raster data in GIS are matrices of discrete cells that represent features on, above or below the earth’s surface. Each cell in the raster grid has the same size, and cells are usually rectangular (in QGIS they will always be rectangular). Typical raster datasets include remote sensing data, such as aerial photography, or satellite imagery and modelled data, such as an elevation matrix. Unlike vector data, raster data typically do not have an associated database record for each cell. They are geocoded by pixel resolution and the X/Y coordinate of a corner pixel of the raster layer. This allows QGIS to position the data correctly in the map canvas. QGIS makes use of georeference information inside the raster layer (e.g., GeoTiff) or in an appropriate world file to properly display the data. Many of the features available in QGIS work the same, regardless the vector data source. However, because of the differences in formats specifications (ESRI Shapefile, MapInfo and MicroStation file formats, AutoCAD DXF, PostGIS, SpatiaLite, DB2, Oracle Spatial and MSSQL Spatial databases, and many more), QGIS may handle differently some of their properties. This section describes how to work with these specificities. QGIS supports (multi)point, (multi)line, (multi)polygon, CircularString, CompoundCurve, CurvePolygon, MultiCurve, MultiSurface feature types, all with Z and/or M values. You should note also that some drivers don’t support some of these feature types like CircularString, CompoundCurve, CurvePolygon, MultiCurve, MultiSurface feature type. QGIS will convert them to (multi)polygon feature. ESRI Shapefile is still one of the most used vector file format in QGIS. However, this file format has some limitation that some other file format have not (like GeoPackage, SpatiaLite). Support is provided by the OGR Simple Feature Library. A Shapefile format dataset can also include a file with a .prj suffix, which contains the projection information. While it is very useful to have a projection file, it is not mandatory. A Shapefile format dataset can contain additional files. For further details, see the ESRI technical specification at https://www.esri.com/library/whitepapers/pdfs/shapefile.pdf. To improve the performance of drawing a Shapefile format dataset, you can create a spatial index. A spatial index will improve the speed of both zooming and panning. Spatial indexes used by QGIS have a .qix extension. Load a Shapefile format dataset (see The Browser Panel). Open the Layer Properties dialog by double-clicking on the layer name in the legend or by right-clicking and choosing Properties… from the context menu. In the Source tab, click the Create Spatial Index button. If you load a Shapefile format dataset with a .prj file and QGIS is not able to read the coordinate reference system from that file, you will need to define the proper projection manually within the Layer Properties ‣ Source tab of the layer by clicking the Select CRS button. This is due to the fact that .prj files often do not provide the complete projection parameters as used in QGIS and listed in the CRS dialog. For the same reason, if you create a new Shapefile format dataset with QGIS, two different projection files are created: a .prj file with limited projection parameters, compatible with ESRI software, and a .qpj file, providing the complete parameters of the used CRS. Whenever QGIS finds a .qpj file, it will be used instead of the .prj. Delimited text file is a very common and widely used format because of its simplicity and readability – data can be viewed and edited even in a plain text editor. A delimited text file is a tabular data with each column separated by a defined character and each row separated by a line break. The first row usually contains the column names. A common type of delimited text file is a CSV (Comma Separated Values), with each column separated by a comma. Such data files can also contain positional information (see Storing geometry information in delimited text file). The file must have a delimited header row of field names. This must be the first line of the data (ideally the first row in the text file). If geometry should be enabled, the header row must contain field(s) with geometry definition. These field(s) can have any name. The X and Y coordinates fields (if geometry is defined by coordinates) must be specified as numbers. The coordinate system is not important. If you have any data that is not a string (text) and the file is a CSV file, you must have a CSVT file (see section Using CSVT file to control field formatting). The example text file uses ; (semicolon) as delimiter. Any character can be used to delimit the fields. The first row is the header row. It contains the fields X, Y and ELEV. No quotes (") are used to delimit text fields. The X coordinates are contained in the X field. The Y coordinates are contained in the Y field. As well-known text (WKT) representation of geometry in a single column, for any geometry type. This file is saved in the same folder as the .csv file, with the same name, but .csvt as the extension. You can find more information at GDAL CSV Driver. PostGIS layers are stored in a PostgreSQL database. The advantages of PostGIS are its spatial indexing, filtering and querying capabilities it provides. Using PostGIS, vector functions such as select and identify work more accurately than they do with OGR layers in QGIS. Normally, a PostGIS layer is defined by an entry in the geometry_columns table. QGIS can load layers that do not have an entry in the geometry_columns table. This includes both tables and views. Defining a spatial view provides a powerful means to visualize your data. Refer to your PostgreSQL manual for information on creating views. This section contains some details on how QGIS accesses PostgreSQL layers. Most of the time, QGIS should simply provide you with a list of database tables that can be loaded, and it will load them on request. However, if you have trouble loading a PostgreSQL table into QGIS, the information below may help you understand any QGIS messages and give you direction on changing the PostgreSQL table or view definition to allow QGIS to load it. QGIS requires that PostgreSQL layers contain a column that can be used as a unique key for the layer. For tables, this usually means that the table needs a primary key, or a column with a unique constraint on it. In QGIS, this column needs to be of type int4 (an integer of size 4 bytes). Alternatively, the ctid column can be used as primary key. If a table lacks these items, the oid column will be used instead. Performance will be improved if the column is indexed (note that primary keys are automatically indexed in PostgreSQL). QGIS offers a checkbox Select at id that is activated by default. This option gets the ids without the attributes which is faster in most cases. If the PostgreSQL layer is a view, the same requirement exists, but views do not always have primary keys or columns with unique constraints on them. You have to define a primary key field (has to be integer) in the QGIS dialog before you can load the view. If a suitable column does not exist in the view, QGIS will not load the layer. If this occurs, the solution is to alter the view so that it does include a suitable column (a type of integer and either a primary key or with a unique constraint, preferably indexed). As for table, a checkbox Select at id is activated by default (see above for the meaning of the checkbox). It can make sense to disable this option when you use expensive views. QGIS allows to filter features already on server side. Check the Settings ‣ Options ‣ Data Sources ‣ Execute expressions on postgres server-side if possible checkbox to do so. Only supported expressions will be sent to the database. Expressions using unsupported operators or functions will gracefully fallback to local evaluation. Most of common data types are supported by the PostgreSQL provider: integer, float, varchar, geometry, timestamp, array and hstore. Data can be imported into PostgreSQL/PostGIS using several tools, including the DB Manager plugin and the command line tools shp2pgsql and ogr2ogr. QGIS comes with a core plugin named DB Manager. It can be used to load data, and it includes support for schemas. See section DB Manager Plugin for more information. This creates a new layer named lakes_new in the gis_data database. The new layer will have a spatial reference identifier (SRID) of 2964. See section Working with Projections for more information on spatial reference systems and projections. Like the import tool shp2pgsql, there is also a tool to export PostGIS datasets in the Shapefile format: pgsql2shp. This is shipped within your PostGIS distribution. Besides shp2pgsql and DB Manager, there is another tool for feeding geodata in PostGIS: ogr2ogr. This is part of your GDAL installation. This will import the Shapefile format dataset alaska.shp into the PostGIS database postgis using the user postgres with the password topsecret on host server myhost.de. ogr2ogr does not create spatial indexes like shp2pgsl does. You need to create them manually, using the normal SQL command CREATE INDEX afterwards as an extra step (as described in the next section Improving Performance). Retrieving features from a PostgreSQL database can be time-consuming, especially over a network. You can improve the drawing performance of PostgreSQL layers by ensuring that a PostGIS spatial index exists on each layer in the database. PostGIS supports creation of a GiST (Generalized Search Tree) index to speed up spatial searches of the data (GiST index information is taken from the PostGIS documentation available at https://postgis.net). You can use the DBManager to create an index to your layer. You should first select the layer and click on Table ‣ Edit table, go to Indexes tab and click on Add Spatial Index. Note that for large tables, creating the index can take a long time. Once the index is created, you should perform a VACUUM ANALYZE. See the PostGIS documentation (POSTGIS-PROJECT Literature and Web References) for more information. Welcome to psql 8.3.0, the PostgreSQL interactive terminal. Many GIS packages don’t wrap vector maps with a geographic reference system (lat/lon) crossing the 180 degrees longitude line (http://postgis.refractions.net/documentation/manual-2.0/ST_Shift_Longitude.html). As result, if we open such a map in QGIS, we will see two far, distinct locations, that should appear near each other. 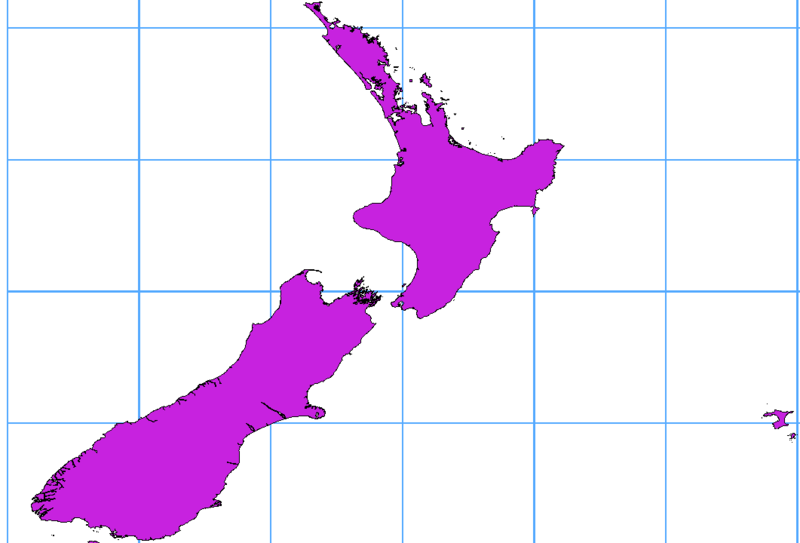 In Figure_vector_crossing, the tiny point on the far left of the map canvas (Chatham Islands) should be within the grid, to the right of the New Zealand main islands. A work-around is to transform the longitude values using PostGIS and the ST_Shift_Longitude function. This function reads every point/vertex in every component of every feature in a geometry, and if the longitude coordinate is < 0°, it adds 360° to it. The result is a 0° - 360° version of the data to be plotted in a 180°-centric map. Import data into PostGIS (Importing Data into PostgreSQL) using, for example, the DB Manager plugin. If everything went well, you should receive a confirmation about the number of features that were updated. Then you’ll be able to load the map and see the difference (Figure_vector_crossing_map). If you want to save a vector layer to SpatiaLite format, you can do this by right clicking the layer in the legend. Then, click on Save as…, define the name of the output file, and select ‘SpatiaLite’ as format and the CRS. Also, you can select ‘SQLite’ as format and then add SPATIALITE=YES in the OGR data source creation option field. This tells OGR to create a SpatiaLite database. See also https://www.gdal.org/ogr/drv_sqlite.html. QGIS also supports editable views in SpatiaLite. If you want to create a new SpatiaLite layer, please refer to section Creating a new SpatiaLite layer. For SpatiaLite data management, you can also use several Python plugins: QSpatiaLite, SpatiaLite Manager or DB Manager (core plugin, recommended). If necessary, they can be downloaded and installed with the Plugin Installer. IBM DB2 for Linux, Unix and Windows (DB2 LUW), IBM DB2 for z/OS (mainframe) and IBM DashDB products allow users to store and analyse spatial data in relational table columns. The DB2 provider for QGIS supports the full range of visualization, analysis and manipulation of spatial data in these databases. User documentation on these capabilities can be found at the DB2 z/OS KnowledgeCenter, DB2 LUW KnowledgeCenter and DB2 DashDB KnowledgeCenter. For more information about working with the DB2 spatial capabilities, check out the DB2 Spatial Tutorial on IBM DeveloperWorks. The DB2 provider currently only supports the Windows environment through the Windows ODBC driver. To open a DB2 data in QGIS, you can refer to The Browser Panel or Loading a Database Layer section. If you are accessing a DB2 LUW database on the same machine or using DB2 LUW as a client, the DB2 executables and supporting files need to be included in the Windows path. This can be done by creating a batch file like the following with the name db2.bat and including it in the directory %OSGEO4W_ROOT%/etc/ini.